General Motors has just released the new Chevrolet bolt electric car at the Detroit auto show. It is supposed to offer an impressive 200 mile range in a compact car on electric battery. This is a significant step forward for those people who need a city car for commuting. But have been reluctant due to the lower distance limitations of most other full electric cars. With a 200 mile range this is really a significant improvement. Commuters in cities and towns can now commute with confidence. They will be able to go to and from work without needing a charge for most commuters. They will need to recharge the batteries once per day over night. It is a pure electric vehicle and at 200 mile range it is very competitive with the other players. 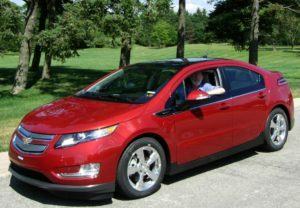 It will be a companion car to the Chevrolet volt which is a combination gas-electric vehicle. Since it is a concept car, the vehicle range may improve even further as batter technology improves. There is an incredible amount of focus on developing better battery technology, generation capabilities and efficient power consumption. The price of the Chevrolet bolt is claimed to be around $30,000 US. However it will be a few years before it hits dealer show rooms. There is no timeline as of yet from General Motors. Although General Motors has promised five new vehicles in 2015. When gasoline prices were high, driven by high oil prices in the $100 range, there was a lot of motivation to get electric cars on the roads to control gas expense and pollution. With recent declines in oil prices to less than $50, many consumers will lose their interest in electric vehicles. The savings will not be as great and it will take longer for the electric vehicles to pay for themselves. There will have to be continued pressure on car manufacturers to improve gasoline driven cars and to also drive electric vehicles to a level that appeals to consumers. Unfortunately from a pollution perspective, this recent decline in oil prices is not going to help those organizations meet their objectives and goals. It will be up to government to drive everyone to better more efficient cars etc.